Good note taking can help you ace your tests, but bad note taking can really get in the way of getting great grades. 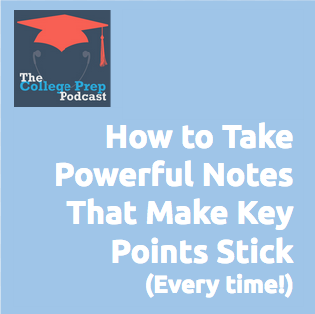 In a future episode of the podcast, she will share with you how to use your notes to study for tests. After all, the main point of good notetaking is to take the stress out of studying! If you’d like to take your note-taking and study skills a step further, consider signing up for Gretchen’s Best Semester Ever program, during which she walks you step-by-step through taking the stress out of studying and personalizes the strategies just for you. Also, if you are someone who has a learning difference that makes it impossible to listen to a teacher AND take notes at the same time, the Smart Pen might just change your life! Check it out.